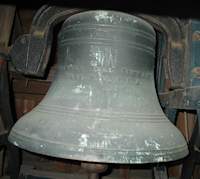 Old South Haven Presbyterian Church members have been ringing our 120 year old church bell at 8:12 each evening this week. We are doing this to honor those who stood up for racial and ethnic equality in Charlottesville on 8/12/17, and as a call for solidarity against bigotry in all its forms. We plan to continue this through the month of September and hope that other churches will join us, ringing their bells to affirm God's vision for our society: peace, justice, and love.